At the core of our company is our flat fee IT support and network management, the foundation on which we are built. We understand that businesses need to forecast budgets for their managed service expenses coupled with the confidence that their systems are running efficiently. In today’s world of ever integrating technologies it is difficult to operate your business when there are problems in your systems. A help desk is effective to all organizations, large or small, and with 4 Corner IT’s support services, you can leverage this for your specific needs also. Living with the pain of an under-performing computer or an application not functioning to its design can cause inefficiencies and loss of morale. Our proactive approach to the overall health of your systems as well as our instant support for the staff running your company will prove results to your bottom line. Feel the power, pleasure and peace of mind of a help desk that acts as an extension of your business. Combine with cloud solutions to cut-costs and become more effective with less upgrades on in-house equipment. Reduce your overall computer support cost with an affordable IT Support staff, as opposed to an hourly computer technician. Get personalized attention to the applications you use and let us do all the heavy lifting. 4 Corner IT can even guide you step-by-step in choosing the right technology for your business. Inefficiencies are everywhere. 4 Corner IT can spot the bottlenecks in your industry such as dated or non-upgradable hardware. 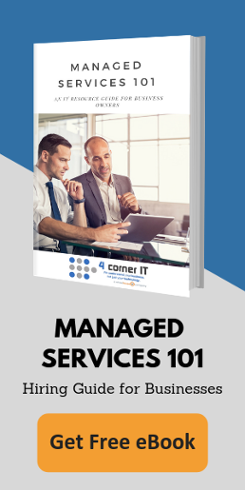 Learning technology is hard enough and keeping up with it is something else, so let our managed services help leverage your business to new, unseen heights! Have your computer network monitoring and protection centrally managed by our proactive team. Have your internal staff lean on our 24/7/365 team so your internal staff can focus on growing and improving your company. Want to only use only some of our products and services but not all? No problem! We have plans that can fit into the gaps of your IT infrastructure. * On-site arrangements vary based on location. Click here to inquire about different plans and packages for computer support and managed services that fit into your business.